The set makers have released a universal SDK that will play nice with TVs from all three companies. Just as computers have two main operating systems, less powerful devices like TVs, smartphones and set-top boxes have the choice between Android and, well, Android. Of course, they could always make their own proprietary OS, but trying to attract developers to such a limited market is a hard sell. That's why LG, Sharp, and Philips have decided to work together on a standard that would work across all their platforms. By sharing one standard, they'll have a much easier time wooing developers. After all, making an app for three brands is a lot more attractive than making one for a single brand. 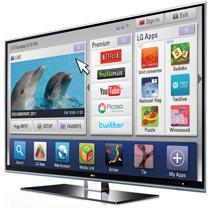 "This cooperation is nothing less than a watershed in the brief history of Smart TVs," says LG president Havis Kwon. "By working in partnership with two innovators in TVs, we've taken a major step towards creating an app market every bit as inventive and dynamic as the one that exists for smartphones."